Data centers that need fast access to data in Tier 2 environments need look no further. The HGST Ultrastar 7K2 delivers fast data access in capacityoptimized, enterprise-class storage systems. Enhanced RAFF technology in the 7K2 includes sophisticated electronics to monitor the drive and correct both linear and rotational vibration disturbances in real time—especially helpful in multi-drive arrays and rack-mounted systems maintaining high read/ write performance. 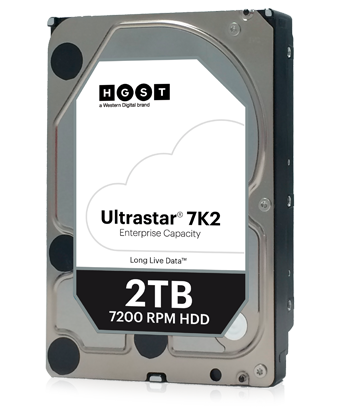 Designed to handle workloads up to 550TB per year, the Ultrastar 7K2 delivers up to 2TB of affordable storage capacity for highintensity applications in enterprise-class environments. Data centers face growing pressures to store more with flat-to-shrinking budgets. Keeping systems operational for as long as possible to maximize investments can be an effective part of the strategy, but supporting those legacy applications becomes even more challenging as drive technologies move to next generation formats and interfaces. The 7K2 has a SATA 6Gb/s interface and native 512-byte (512n) sector size to provide consistent, high performance and compatibility with legacy data center applications. Dualstage actuator technology provides a head positioning system that improves positional accuracy over the data tracks, enabling data to be written to and read from the drive more reliably. Trust HGST to deliver storage options that allow data centers to get the most from their hardware investment. Multi-axis shock sensor technology automatically detects the smallest shock events and compensates to protect stored data. RAID-specific, time-limited error recovery reduces drive fallout caused by extended hard drive errorrecovery processes. Ramp load/unload technology keeps the recording heads away from the disk media during idle time and power down, ensuring significantly less wear to the recording heads and media as well as better drive protection in transit. Through the use of dynamic fly height technology, each read-write head’s fly height is adjusted in real time for optimum reliability and performance. With a 2M hour MTBF rating and a 5-year warranty, rely on Ultrastar 7K2 to deliver capacity, performance and reliability for more value to your data center. 1 One MB is equal to one million bytes, one GB is equal to one billion bytes and one TB equals 1,000GB (one trillion bytes) when referring to hard drive capacity. Accessible capacity will vary from the stated capacity due to formatting and partitioning of the hard drive, the computer’s operating system, and other factors. 2 MTBF and AFR specifications are based on a sample population and are estimated by statistical measurements and acceleration algorithms under typical operating conditions for this drive model. MTBF and AFR ratings do not predict an individual drive’s reliability and do not constitute a warranty. DiskStorageWorks.com is a division of Virtual Graffiti Inc, an authorized HGST reseller.